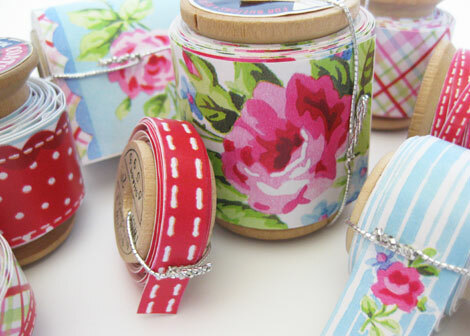 I’ve found a new obsession in paper tape. So in an effort to feed the need, I decided to simply make my own. It’s crazy easy, if you have the right materials and tools. This tutorial is for making peel-away backed tape. I ordered of 3M Positionable Mounting Adhesive roll from Amazon.com. This is the perfect stuff for creating your own tape. It is a bit costly at $40 per roll, but possibly you can split it with a friend or plan to make enough tape to gift or sell. There are other double-sided adhesive options you can look into that may cost less, however, the large roll allows for much longer sections of tape for spool rolling. I found this sweet pattern-stripe gift wrap, Fairground Stripes, at the fabulous shop Sunnyside Cottage in Santa Rosa, CA. Stripes are fun, you can cut along them or across them, but any small patterned paper works great for making your own tape. I cut three identical sections to lay end to end along the roll of adhesive. Once all three lengths of wrap patterns were laid out on the adhesive roll and burnished, I sliced between the patterns using an Xacto knife and straight-edge on my Martha Stewart Cutting Mat. 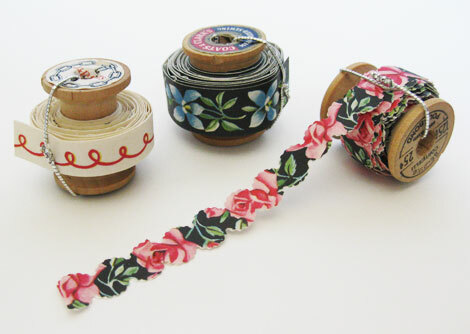 With each strip cut, I wound the tape onto vintage wooden spools. You can trim away just a bit of the backing at one end to adhere the tape to the spool to keep the tape from slipping as you wind. 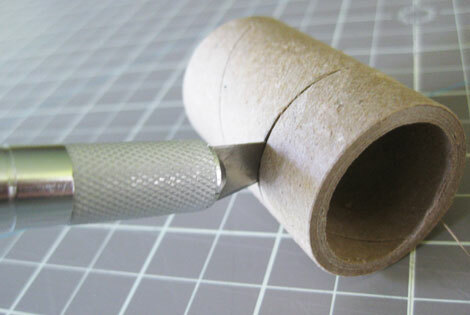 You can also use a dense cardboard tube measured and cut into spools. The tube from your Saran Wrap will work great. I had some small tubes in my stash that I cut to the same width as some of my tape. Once wound, I used some thin silver threaded wire to hold the roll together. Floral wire would be good, too. The wire is easily moved when using the roll and repositioned to hold the remaining tape. 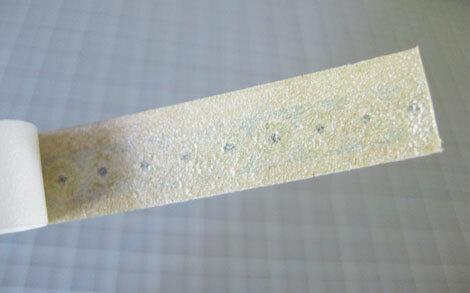 You can see the adhesive on the back of the tape once the backing paper is pulled off. Although the adhesive product is referred to as repositionable, it does become permanent once used. 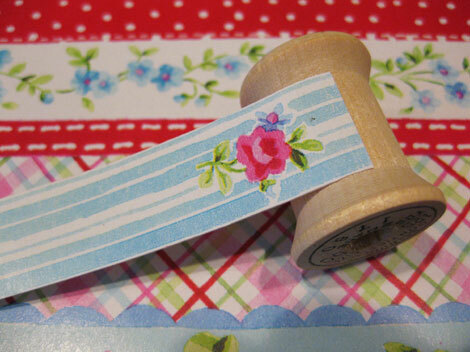 I also made vintage wrapping paper tape. 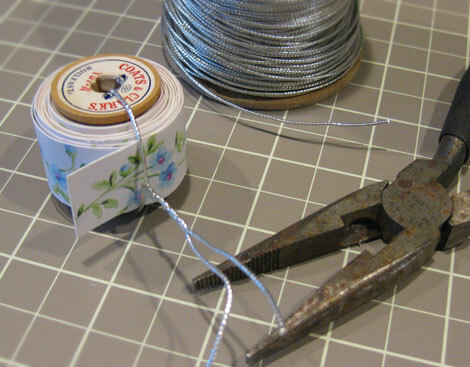 You can trim your tape with decorative edge punches and scissors. 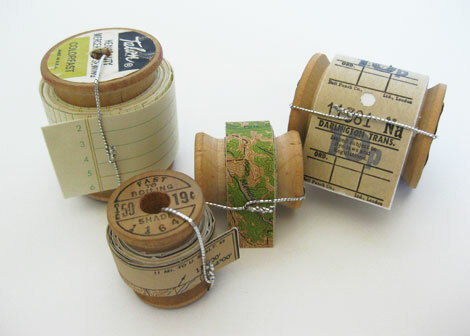 I made a few rolls of paper tape with vintage maps, ledger paper and an old train ticket roll. For even more custom tape, I printed my own designs to thin kraft paper from a roll I picked up at the flea market yesterday. To ease thinner paper into your printer, it’s good to adhere a standard sheet of paper to one end as a feeder sheet to be removed after printing. I cut my kraft paper to the page size of my graphics which was 8.5″ x 14″. I laid out each design three times with thin cutting guide lines. 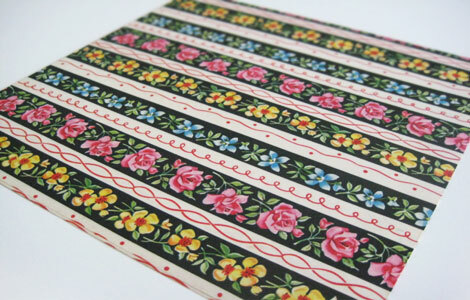 Once printed, I trimmed out all the rows and placed each design end to end on the adhesive roll and trimmed into tape. My graphics were simply alphabets, numbers and borders. You can also print to plain paper and create special event graphics, words and names. 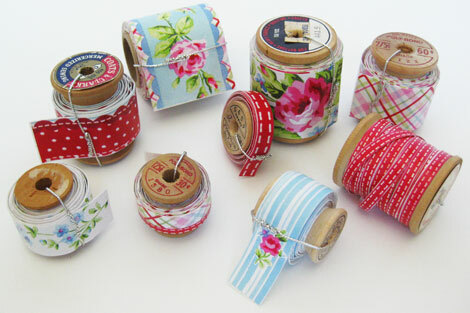 All this tape will be so much fun to use for lots of projects- sealing stationery and gifts, making crafts, decorating things, gifting and more. Note that when the tape unwinds from the spool that the decorative paper will split in sections at the seams where the paper pieces begin and end, though the backing remains one long piece. 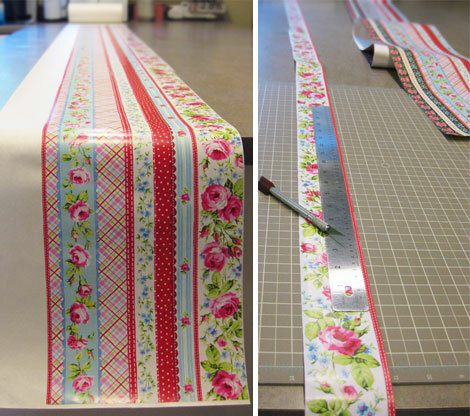 To keep tape from coming apart in those areas, you can laminate the entire connected sections of paper with one long piece of Clear Con-Tact shelf liner before slicing into rows of tape. This will also give the tape a sheener surface. You can use this same tutorial for easily creating ribbon tape by laying rows of various ribbon tightly side by side and trimming between each. This entry was posted in Birthday Craft, Collecting, Greeting Cards, Holiday Crafts, Paper Crafts, Paper Tape and tagged Paper Tape, washi tape. Bookmark the permalink. Wow, this is a great tutorial, i would have never thought of this, but since you did, i am sure this idea will spread like wildfire, thanks. now i want loads and loads of cool tapes. all kinds of vintage wall papers should be involved. you of course are loading my to-do list a mile high. thank you miss cathe. again . and. again. So very cool and you are very creative! Another excellent idea! Thanks for sharing! PERFECTION!!! i made some fabric tape before but this is awwww…. Love this idea!! Wish I could take your class at The Creative Connection – your students are all going to be so lucky! Found you through Pinterest! What a great tutorial! Thank you! Wow, I’ve always considered myself pretty darn crafty but clearly I’m not worthy…I bow to you! Just amazing. Great ideas, Cathe. That’s a lot of tape! What did you use to adhere the thin kraft paper to regular paper before sending it through the printer? Hi Jeannie, I used a couple of dabs of Xyron adhesive runner. You are a genius!!! AND so kind to share just HOW to do it. Thank you, thank you. You are inspiring! I am loving that product and was not familiar with it. Thanks for the tutorial and I think i need to order myself some and get some crafting going on. Gooooorgeous! And I love how you have them on the wooden spools – too cool! I love this idea! You can use any paper you want to make the tape. Thanks so much for a terrific idea! I subscribe to your blog and love all your wonderful vintage finds and creations. This was so great to read. Thank you so much for sharing your process. My friends & I have become rather obsessed with Japanese Washi tape. It adds another fun element to our Art Journaling projects. I look forward to trying your idea. Thanks again. I love this! I’m already obsessed with double sided tape so I see a new favorite in my near future! .. what shall I say???? Loveable, pretty, nice,……. the better to say: It´s a perfect idea! Such a fabulous idea. I love all of the tape that you have created. Wow, this is just wonderful. I love your idea and going to try this myself. Thanks so much for the inspiration. I love tape but I don’t always love what is out there. Now I can make tape out of my vintage ledger papers. This is genius as far as I am concerned. Love, Love, Love this tutorial. I love those paper tapes but sometimes they are sort of flimsy. These will be so much better. Must try it out this afternoon as soon as I get the supplies I need! Thanks so much for showing us how to do this! whoa! that is so cool! thanks for the awesome tutorial!!! Oh My Goodness this is fabulous! I love ALL the tapes you made. What fun !!!!! great idea – very clever. ! I’m definitely going to try this. What great options for printing with a special design name or message. Lots of great uses. Thanks! Many, many super ideas in this posting! 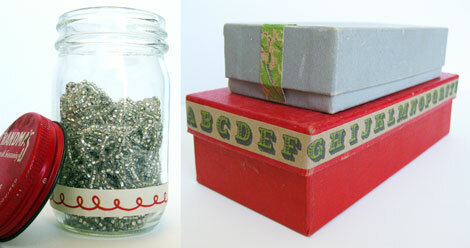 This would make wonderful gifts for scrapping and artist friends. Thank you! Wow! What an amazing Christmas gift that would be. Thanks!! This is utterly brilliant, Cathe–thanks for sharing it! Cathe., this is brilliant! I’m so glad you are willing to share these great ideas you come up with…I love the potential here and using the old spools really takes the cake! Cathe Holden! Just when I thought you couldn’t be my craft hero more than you already are….well, dang girl! You go and blow my mind again!! Bravo! Fabulous! Love the different ways you showed to use it. Thanks for taking the time to do this. And share the roll with a friend? No need, me thinks…. This is charming! I love your ideas and blog! Genius. I don’t even know what else to say but genius. Because I needed a new project to get all excited about instead of doing laundry today?! Brilliant! I haven’t used paper tape yet but I can think of a lot of ways to use a huge roll of double sided adhesive. In fact I wanted page-size sheets of it recently. Thanks for the tutorial! Another great idea Cathe!!! Maybe I can put my old “giant” Xyron to use again! I can do at least an 8.5 wide strip! Thanks!!! Love this idea!! Would you mind if I shared your idea on my blog with a link back to you? Woman … you are my craft HERO! This is genius and I am smitten with all of it. Thank you so much for the awesome inspiration! A fabulous idea! Love it! Wow- this is amazing! I’ve only recently discovered your blog, and I have to tell you how amazingly inspirational you are! Thank you! YOU are AMAZING! Hello… this is BRILLIANT! this is wonderful…i can never get enough of your talent…thank you for being so generous and sharing all your gifts! You are so inventive. I especially like your own printed alphabet. It would be so expensive in the shops. This is a WONDERFUL idea — thanks so much for sharing it with us! Awsome tutorial as always. Just love the paper you selected for all of your new tape. This is another keeper to add to me huge collection of to-do’s. Thank you, you are the best. Wow, thanks for this great idea! I love making stickers with my xyron machine, but this is probably more cost effective when wanting to make a whole spool of tape…. I wonder if it would work the same for fabric? This is so creative! You are so talented! This is really beautiful, Cathe, and so simple. I’ve pinned it (pinterest) and will be having a try real soon. One of your very best ever! Thank you so much for your generous sharing of fabulous ideas. Simply put, you are a genius!! Anything you think you don’t have, you just come up with a creative way to make them yourself!! I know necessity is the mother of invention but you often seem to invent and then we find that we could all use your ideas and we all always needed them but we didn’t know till we saw it on your blog. Anyway, you get the point, thank you so much for sharing your true creative genius!!! Love this idea, I would have never thought of it! Thank you! Pingback: Centsational Girl » Blog Archive » BOTB 6.19.11 + Happy Father’s Day! Those tapes are absolutely beautiful! The possibilities are endless. Great tutorial, I saw this link on Centsational Girl And it was so fun to see that you are in Petaluma area. I love Santa Rosa and the Petaluma area, my dad lived there for years, so beautiful. This tape is lovely!! What a brilliant idea! I think I am going to have to go make some=) Thanks for sharing! Love your tutorial. I can do this with some of my scraps of paper too. This is time consuming but a lot cheaper! Thanks for sharing. I already commented earlier but just want to know where I can get that tape since Amazon doesn’t show it anymore. Atleast I don’t see any price listed there. May be they are out of stock? Thanks. absolutely smitten with this idea! i even like using the paper tape rolls strictly as display. pretty with purpose. thanks for the creative concept! Very Cool! Thanks for sharing! Awesome tutorial as always! awesomeness. really fab. i have this huge bunch of tickets and paper that my husband has collected. maybe i can do something on these lines. 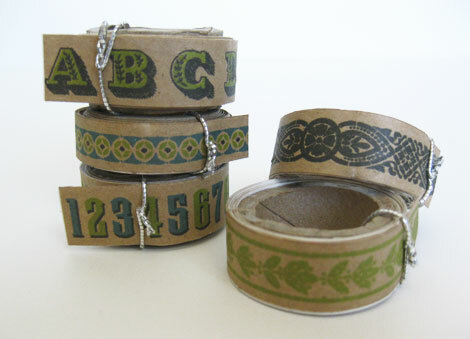 What a great idea for making your own tape! I am definitely going to try this…thanks for sharing! Love this tutorial and idea for the custom tape. Gonna have to try this out for sure! This is so amazing! Each of your tapes are beautiful! I found your blog through One Pretty Thing, and I’m so glad I did! You are too much! Shear creative genius. New fan! HAD to pin this…so CUTE! Just love this idea and what a great tutorial. Great idea for Christmas presents for my crop group. Thank you for sharing your inspiration. BRILLIANT. I’m very impressed and amazed. Thank you for making such a nice tutorial as well. I’m inspired and want to rush out a buy tape and try this. Amazing tutorial! I linked to your post in my blog, I hope you don’t mind! An amazing and inspiring tutorial – I can’t wait to make a few of these myself !! thanks for sharing this with us ! What an absolutely brilliant idea. I am overwhelmed with the possibilities. Thank you so much for sharing. Wow, you really have my head spinning. I can think of tons of uses for these tapes….my dad’s old lake charts, my son’s discarded music and marching drill sheets….would make fantastic scrapbook pages! TY so much for getting my head thinking. Great idea.. I wonder if this would work with fabric as well? Great Tute, thanks for sharing Cathe!! Love it! Tried to find an email to the store…. This is absolutely fantastic…thank you TONS for sharing the idea. While working on a tutorial for DIY paper tape I decided to do a search and found yours so I included a link in my post. I love your wrapping paper! I used a different adhesive tape and paper I made by scanning some fabric I had. 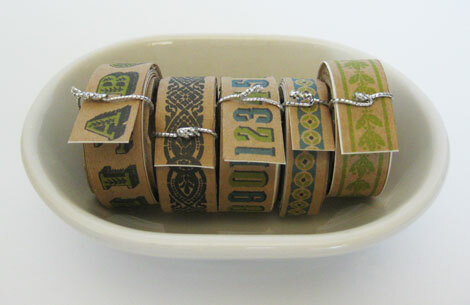 You can view the post here: http://www.aestheticnest.com/2011/09/craft-diy-printed-paper-tape-washi-tape.html#more Thanks! Love this. I can make my own wallpaper border. Of coarse I will do ribbons as well. Thanks !!! I just found your tut and love it! I made fabric tape using two-sided tape sheet I’ve had in my stash for years and it worked great but this looks like it would be even better. Sure would like to find a smaller supply!! Thanks. Just excellent. I can’t even tell you how inspiring (and creativity-jump-starting) this tutorial is. Thank you SO much! I love tour vintage map tape, but not crafty at all, could I buy some from you? These are awesome! (just found you on Pinterest!). I wonder if it would work using straight up 3M double sided tape….have you tried it? I saw this on Pinterest and clicked on the picture only to find out it was YOU! I had forgotten your website and was dang excited to “see” you again. It was sure nice meeting you at *SPARK3* and I sure hope to see you next year. I LOVE my nest. Thanks for being such a terrific teacher. Great tutorial. Thanks for sharing your genius! Brilliant! The possibilities are endless! Thank you for another great idea. I did the same thing using patterned tissue paper and Scor-tape. Awesome tutorial and ideas. I love paper tape. I generally just draw neat things onto my masking tape, but I may have to try this. Just found this on Pinterest. FABULOUS. Not sure if this has already been suggested but…A roll of carpet tape is sitting next to me on my desk and it just dawned on me that you could use that and avoid the initial cost of the roll. Not as repositional perhaps, but easily affordable if you don’t mind the 2″ width. I have looked every where since i seen this, and i can’t find that tape any where, i live in Indiana, i even tried Hobby Lobby’s and JoAnn’s too! 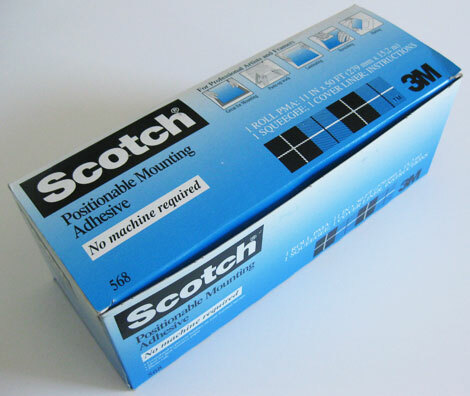 Even the web sight for Scotch doesn’t have it:( So i’l keep looking, if someone know where i can order it Pleae let me know..
WOW, I had no idea you could make your own paper tape. I am new to the whole Washi Tape and other paper tapes but can’t wait to start using them. I would like to invite you to share this, and any other posts, at my Creative Thursday Link Party (open until Monday) at http://www.michellestastycreations.blogspot.com. I am horrible at wrapping. This is inspiring, so I am going to try this. I’ll let you know how it works out. Trust me….. It has to be 99% better then mine. Thank you so much for such wonderful instructions. I was having a hard time finding paper tape in my area and I came across your tute. I just love that I can use my paper and create a custom design. Again thank- you~ I have been a follower for a while- you always amaze and inspire me!! Just curious as to how you got the Rose tape cut so finely after sticking it? It has such an intri”cut” pattern per the edges. Wow. This is so amazing. You are an absolute genius, thank you so much for posting this! I love your vintage style. Such a great idea! Hey Cathe, we just wanted to let you know we thought this was such a fantastic idea that we will be posting about it on our Facebook page on Wednesday, August 1st! This arrived in my email box this morning and I’m very excited about trying it out.! Great tutorial; very clear directions on how to do. Great ideas! love the homemade tape!! Fabulous ideas. I will start making my own since I find it hard to spend $3 for a roll I may only use a few times. Now I can always make more when needed. Thanks so much. I wonder if this would work with fabric, too? I’ve seen some cute fabric tapes I’d like to try. What do you think? AWESOME tutorial, too – thank you!!!! I’ve never seen this kind of (what appears to be) clear double-sided tape. We of course do have the normal scrapbooking double-sided tape and red score tape here in South Africa, but the 3M make and sort you mention, I don’t think is available to us here. Is there a way you are aware of to use normal double sided tape, or anything else to make these beautiful hand-crafted tapes. I think they are beautiful. We do get con-tact adhesive rolls here here, so that part I can do. Thank you for sharing your knowledge. Nice idea. Have you try using fabric?